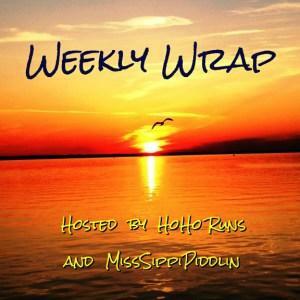 Monday means it’s time to share the Weekly Wrap time with HoHo Runs and MissSippi Piddlin! I had been waiting for this day for what seemed like ever. Clearly, I am not a patient person. I discovered SUP yoga last year, and I was nervous as hell the first time I tried it, but, as it turns out, I fell head over heels in love. There is something so incredibly peaceful about a gentle flow while out on the water with friends. After I got home and cleaned up, my parents came over with some awesome shrimp for the grill. We had that with a ramen noodle salad, Mexican street corn and a fresh peach pie for a delicious Sunday afternoon meal. I’m getting used to the big block of cycling and body circuit on Monday and Friday mornings – it’s just become part of the process: get little man on the bus, mount up, ride like heck, switch to cruiser, rush to class, grind it out with my girls. I opted out of the pool because I was a little tired, but planned to get back in there later in the week. On a brighter note, a package arrived for me! New goggles, new helmet and new cycling gloves! Wheee! I haven’t pulled the trigger on a pair of padded cycling shorts yet. I don’t feel like I’ve really needed them, but we’ll see what happens on a longer, several hour ride. Little man had a pretty grueling karate class. He is doing really well with his forms and stances, but I noticed he needs a bit of work in his core and flexibility. That gave me something to ponder for the night. I had an early morning staff meeting, so I was on my own for the morning’s run. After I got little man from school, I asked him if he wanted to try some yoga. I had found the Cosmic Kids Yoga channel on YouTube, and thought it might be a fun and easy way to help him get some extra bendiness and strength to help him with karate. He started with a Star Wars themed workout and loved it! I had planned on a group ride with some of my running buddies, but it was little man’s class party day and he had asked me if I would be there. The room moms put together an absolutely incredible luau themed event, with lots of fun water activities and great food. It is going to be so hard to move on from second grade. His teacher was nothing short of perfection, and every single kid in his class has been awesome. It was just Dona and I for our morning run, but it was a nice one with a beautiful sunrise. Then it was time to send little man off for his last day of second grade. Mr PugRunner collected him from the bus at early release since I was at work, and then we all got ready for the evening: we were hosting a sac party for our neighbors. We had hot dogs and s’mores and everyone brought a side and something to drink. The kids played on the slip ‘n’ slide and threw water balloons, and as it got darker, they made up dance parties and had all kinds of fun. My goal this summer is to be much less structured and to just go with the flow, and this was the perfect way to do it. Since little man was home from school and Mr PugRunner had to go to work, I had to skip my regular ride. Instead, I packed our bags for the pool and we rode our bikes to my body circuit class. Little man had some kids to play with while I worked out, and then my friend texted to see if she could drop off her son to play for the day so she could get some work done. No problem! The kids played in the pool, we all went out for a nice lunch, and then after some lego and video games, our two families met up for the food truck rally and outdoor showing of The Good Dinosaur. Our community is working hard on these neighborhood events, and it turned out really nicely. I was kind of tried from another late night, but I decided it was time to take on four miles. I wanted to run with my Moms Run This Town Group, but they were starting about 45 minutes later, and I just needed to get it all done. Our house was being painted and I needed to pick up extra paint for our front and back doors, as well as bulbs for our new exterior lights, so I was on a time crunch. On this Memorial Day, let’s take a moment to remember those who have made the ultimate sacrifice. It’s the reason we can enjoy our freedom today. How are you spending the Memorial Day Weekend? It is delicious! I want it weekly! Our neighborhood never really did much of anything, but we have a new HOA and they are really making an effort. I’m thrilled and hope it continues. I love SUP! I didn’t get to go last year, because we don’t have the warm water like you do in Florida. It’s all really dependent on the weather conditions where we go. Hopefully I’ll get out there this year! I got back on the bike today, first time in 6 weeks! It felt great! It does depend on the weather. We have the heat, but June 1 starts our hurricane season, and we get the storms and winds, too. I am hoping to get out on the water every other week. We shall see if it happens. SUP is still on my list of things to try – I’m hoping I’ll be able to this month. I also need to take my bike in for a tune up this month. You need to get out there! You will love it! I feel like I’d topple over if I tried SUP yoga! Killer week! I can’t believe little man is done with 2nd grade! Crazy! Right??? He’s getting so big! I was looking at him the other day and it looked like he shot up three inches. I can’t take it! SUP looks like so much fun but I would definitely fall off the board, haha! People do fall off. Right in the water. Most of the time, the tide’s not high enough that it’s even that deep, so it’s not too hard to get yourself back up. It’s so fun! The food looked yummy! Great job on keeping up all the different workouts. I’m trying hard to get back in the habit of doing different things each day. The rotation of workouts is making me tired, but I know I’m getting stronger. Well, I hope I’m getting stronger. I don’t know. I am not seeing it so much in my running right now, which is frustrating, but I just have to be patient and trust the process. It can be incredibly challenging. I can’t wait for my knee to be healed up so I can try some more complicated poses on the board. I’ve always wanted to try SUP yoga! I finally tried SUP last summer, and it was so much harder than I thought it would be! Hopefully I’ll get a chance to do it this summer. It can definitely be challenging. Right now, as long as the water isn’t too crazy choppy, I don’t struggle with the actual paddling. My goal is to be able to get out in the ocean, but I don’t know how long it will take for me to achieve that. Wow, SUP yoga looks amazing! I think I probably am not coordinated enough, but it looks SO cool! I thought I wasn’t, and I surprised myself! As long as you don’t mind falling into the water, it’s definitely worth a shot! I love all the fun things little man gets to do! His teacher sounds awesome, and I hope 3rd grade is just as great for him. Awesome job with all the workouts once again! I just finally started back. I got some new Mizunos and hopped on the ‘mill last night. I did a run 2 min/walk 1 min 3 miles and it wasn’t too bad! Slow, but not bad. And only a little sore today. I do wear padded cycling shorts on longer rides. However, when riding reeaaalllly long that area goes numb anyway…which turns out to be a good thing on a 50-60 mile ride. SUP yoga sounds like a ton of fun! It’s great your neighborhood gets together like that. What fun! Thanks for linking with us Jenn! SUP yoga looks tough, but I bet it is a lot of fun once you get the hang of it. I don’t think my padded shorts make much difference. I might appreciate them more on longer rides, but my bum is still sore for several days even when I wear them for rides of 30 minutes. That looks like a nice event to bring the neighborhood together.